On the last track we discussed Five Cultural Adaptation Methods. These Five Cultural Adaptation Methods are Assimilation, Integration, Alternation, Rejection, and Marginalization. On this track we will discuss Acculturative Stress in culturally different clients from an ethical perspective. At the end of the track, we will describe a case study and analyze the cultural factors at play in the situation. Clearly when two different cultures come into contact, a complex cognitive process with emotional consequences is put into motion, resulting in stress. Traditionally the different levels of stress associated with acculturation have been referred to as the "culture shock" syndrome. However, in recent years, the term acculturative stress has been used as a generic reference to the emotional difficulties experienced by culturally different clients who transition to a new environment and culture. "Culture shock" is now usually reserved for severe levels of acculturative stress that result in an extreme lack of capacity to function in the new environment. Obviously there are a number of consequences in daily living that result from coping with acculturative stress, even if the culturally different client is not dealing with the more severe "culture shock." Does your culturally different client complain of physical health problems? Or, maybe he or she has difficulties making decisions? As you are well aware, these can all be consequences of acculturative stress. I have found, probably like you, that many models of acculturative stress pertain to specific groups, such as refugees, African Americans, and Hispanics. However, regardless of the specific cultural group, Williams and Berry point out that all models seem to encompass five factors that regulate the relationship between acculturation and stress. The first of these factors that regulate the relationship between acculturation and stress is the mode of acculturation. It goes without saying that the mode of acculturation could be any of the methods we discussed on the previous track. Again, these methods were assimilation, integration, alternation, rejection, and marginalization. The second of these factors is the phase of acculturation. Clearly, the phase of acculturation could be either contact, conflict, crisis, or adaptation. In addition to the factors of mode of acculturation and phase of acculturation, the third factor is the nature of the subculture. I have found that there can be two primary natures of a client’s subculture. The subculture from which my culturally different client comes from can be predominantly multicultural and assimilationist, or prejudiced and discriminatory. Think of your culturally different client. Is their subculture predominantly multicultural and assimilationist, or prejudiced and discriminatory? The fourth factor that regulates the relationship between acculturation and stress is the characteristics of the adapting group. The adapting group is the group the client is moving into. For example, a Hispanic client moving into a white neighborhood would be moving into a white adapting group. As you are aware, the white group may adapt to the Hispanic client, but not always. The characteristics that effect the adapting group’s ability to adapt to your culturally different client include, but are not limited to, age, status, and social support. Finally, the fifth factor that regulates the relationship between acculturation and stress are the characteristics of the acculturating individual. Sciarra states these characteristics include appraisal, coping attitudes, and contact. Does this ring true for your culturally different client? What is your culturally different client’s appraisal of the group they are acculturating to? What is your culturally different client’s coping attitude regarding the group they are acculturating to? What is the quality of your culturally different client’s contact with the group they are acculturating to? At the end of this track, I will describe the social isolation of Javier (hav’-yer) due to language spoken in the household and socioeconomic factors. All these contributed to regulate the relationship between acculturation and stress for Javier. I have found that for culturally different clients dealing with acculturative stress due to any of the five factors of mode of acculturation, phase of acculturation, nature of the subculture, characteristics of the adapting group, and characteristics of the acculturating individual, often a social support is the most comprehensive variable in moderating stress. By that I mean, culturally different clients that are members of groups with developed ethnic and cultural networks will likely suffer less stress. Make sense? Now let’s look at a short case study. As I explain Javier’s case, see if you can determine the factors contributing to his acculturative stress. Javier, age 54 Hispanic, began counseling sessions because he believed someone was planning to kill him and that something bad would happen to him. As these feelings grew stronger, Javier became more and more inhibited from doing things that required leaving his house. Finally, his paranoia became so strong that his wife, Dora (door’-ah) couldn’t even get him to go to work. Javier and Dora were born in Mexico and lived there until three years ago. They speak no English and are socially isolated from their neighborhood, a low-income, middle-age white neighborhood. Although Javier was originally able to find work as a janitor, his job is at stake due to his paranoia. Dora knows that if Javier doesn’t keep the janitor job, he will likely not find another job because he cannot speak English. Dora herself cannot find a job because she stays home to take care of Rosa (rose-ah), their 13-year-old daughter and the last of their 10 children. Javier’s therapist, who was white, made little progress with Javier because Javier did not trust anyone who was not Hispanic. Even with just the basic information given above, it is obvious that Javier is suffering from acculturative stress. What factors do you see contributing to Javier’s acculturative stress? Clearly, one factor is the nature of the subculture. The neighborhood in which Javier, Dora, and Rosa live is a primarily English-speaking neighborhood. For this reason, Javier’s neighbors tend to avoid him, which makes him feel he is in a prejudiced and discriminatory environment. This prejudiced and discriminatory environment in Javier’s subculture is also tied to the next contributing factor. That contributing factor is the characteristics of the adapting group, or neighborhood. By that I mean, the neighborhood is low-income, middle-aged and white. Thus, these characteristics create no social support system for Javier, as he shares few of these characteristics. Finally, the last factor contributing to Javier’s acculturative stress are the characteristics of the acculturating individual, Javier himself. Javier refuses to learn English. This refusal to learn English continues to keep him isolated from his neighborhood and potential sources of support. The therapist found encouraging Javier to vent his frustration during their sessions to be beneficial. This in combination with Rational Emotive Therapy (RET) became an effective tool in Javier’s enrollment in free language courses. RET was used to point out to Javier that it is irrational to expect to live a stress-free life when you refuse to learn to speak the language. 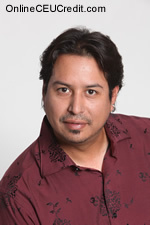 Do you have a culturally different client like Javier who seems to be experiencing acculturative stress? Would Rational Emotive Therapy be beneficial for your client? What ethical implications might this have on you? The ACA Code of Ethics states, "Counselors respect diversity and must not discriminate against clients because of age, color, culture, disability, ethnic group, gender, race, religion, sexual orientation, marital status, or socioeconomic status." On this track we have discussed acculturative stress, as well as compared acculturative stress to "Culture Shock." On the next track we will discuss the modification of three common counseling microskills. What are the five factors that regulate the relationship between acculturation and stress? To select and enter your answer go to Ethics CEU Answer Booklet.